The Sigogne 200th Memorial marks an important and historic spot in Le Petit Bois. After the deportation of the Acadians from Nova Scotia (1755-1758) and following nearly two decades of exile, the displaced Acadians were given permission to return and settle in Nova Scotia. In 1768, Governor Francklyn granted them a tract of land here in southwestern Nova Scotia and he named the district ‘Clare’. 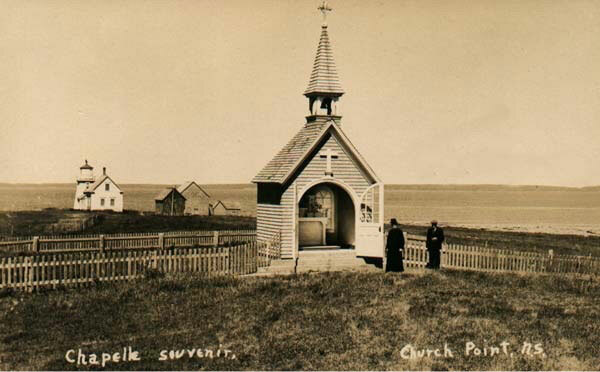 You may be surprised to learn that the village of Church Point (Pointe-de-l’Église) was not named after the large and impressive church that stands today along Route 1. It was named after the first modest parish church that was built here in Le Petit Bois, near the ocean on the point of land projecting into the bay. During the late 1700s this area of Le Petit Bois included a road running parallel to the coast, the first church (Église Sainte-Marie, built in 1786), the residence of the parish priest and the village cemetery. This was the very heart of the community. Port Acadie was the name chosen for this settlement but for some unknown reason, the name was rarely used. The local inhabitants preferred to call the village ‘la pointe de l’église’ (in English: the point where the church is) and that is the name that the community has had ever since. By the 1930s when this photograph was taken, the original parish cemetery was surrounded by a picket fence and graced with a small chapel. 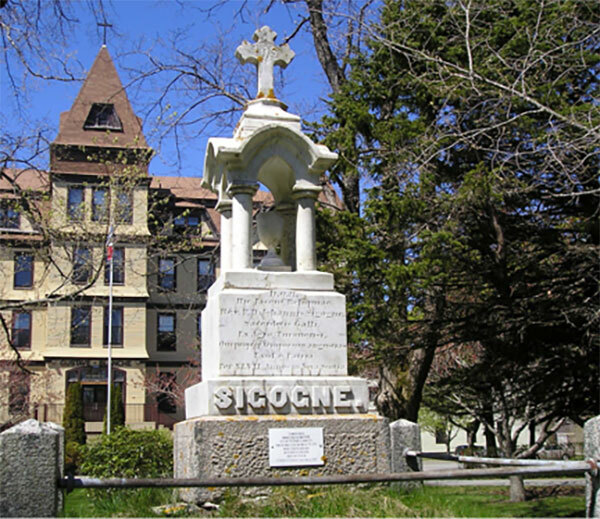 Today, the Sigogne 200th memorial stands approximately where the chapel used to be. By 1799, just 13 years after it was built, it was clear that the first church was both too small and built too close to the shore. It was threatened by the strong coastal wind, storm surges and coastal erosion. 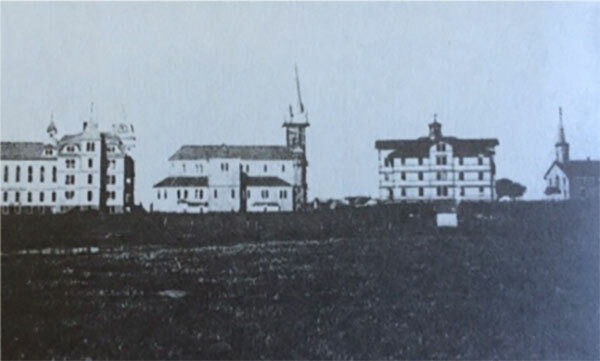 At the turn of the 19th century, the Acadians decided to build a second church and this time they located it well back from the shore along what is now Route 1. By a strange twist of fate, the French Revolution (1789) played a part in bringing one very remarkable person to Clare. The violence and persecutions of the French Revolution caused many Catholic priests to flee from France. One of those refugee priests, Father Jean-Mandé Sigogne, fled to England for 7 years before agreeing to come to Nova Scotia to minister to the Acadians and the Mi’kmaqs of Clare. He arrived in 1799 and served the community until his death 45 years later. The Sigogne 200th monument in Le Petit Bois was erected to mark the 200th anniversary of Sigogne’s arrival in Clare. Sigogne was not only the spiritual leader of the community. He was a pioneer in French language education, founding French schools and encouraging the Acadians to send their children to school. He spoke English well and he dealt with the Nova Scotia government in Halifax, advocating on behalf of the Acadians. He spoke 8 languages in all, including Latin and Greek. In Nova Scotia, he learned the Mi’kmaq language too. He was buried in the original parish cemetery in Le Petit Bois. 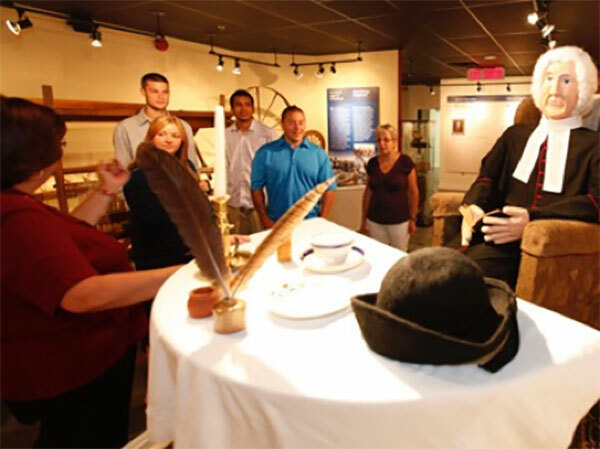 To learn more about Father Sigogne and the early days of Acadian settlement in Clare, visit the interpretive exhibit halls in the Rendez-vous de la Baie. Admission to the exhibit galleries is free of charge.